There are many ways how to encourage children cultivate their reading habits. We as parents are the ones responsible in teaching them to make reading be a part of their daily routine. We need to start motivating them while they are young. To begin with, introduce reading as a fun activity. For toddlers who are pre-readers the use of pop-up books or musical books will not only act as their mode of entertainment but as a mode of learning as well. Give time to tell stories about what the book is all about by showing the pictures and sequence of events through every page. Doing this on a daily basis will encourage them to develop their love for reading. Bring your kids along with you in bookstores where they can find more books of their interest. The best way to get your kids reading more is to expose them in bookstores and book shows. In this way they can explore for books and topics of their interest and that will make them ask you for more books they’ll gobble up. In most cases, some may find the process to be too tedious, however by giving them the freedom of choice in selecting their books to read, they will soon develop a penchant for it. My youngest son is engaged in reading fantasy, Guinness world book of records and mythology books. 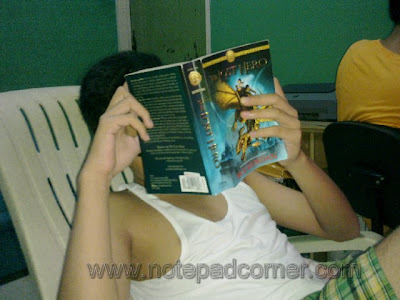 He is an avid fan of Rick Riordan, the author of the stories about demi-gods of the Greek and Roman mythology. Yahmir, likes to read the paper back rather than an ebook, so we buy him his complete set of books in the bookstore. He already had finished the book series and just waiting for the release of the next new book “Mark of Athena” this October. According to studies reading helps in building good habits especially during the early development years of a child. Thus, they will be learning the language better and will be building a better vocabulary. Moreover, as they read more books, it will help them develop their speech at the same time help them learn the basics of grammar to better construct and string together sentences without much effort. More likely, they will make less grammatical errors in written or verbal context. Reading aside from playing educational toys can hone their imagination and encourages their creativeness as well. As kids develop good habits and behavioral patterns through reading on a regular basis, they will become more confident and will be able to express themselves better inside and out of their classrooms. Reading is one of the habits that can benefit a child throughout his life. When we returned to the Philippines, we didn't have to encourage her to read books because her classmates were interested in books and that encouraged her to borrow books at their school library.